Our coop was built to house 2-3 hens. The coop was designed to have an open bottom so the hens can peck and scratch at that bare ground. It also has handles so it can be move around the garden like a ‘chicken-tractor’. The coop is located at the offices/nursery of Bay Maples: Wild California Gardens, a design/build landscape construction company. We will have our garden and nursery open for people to tour during the event. 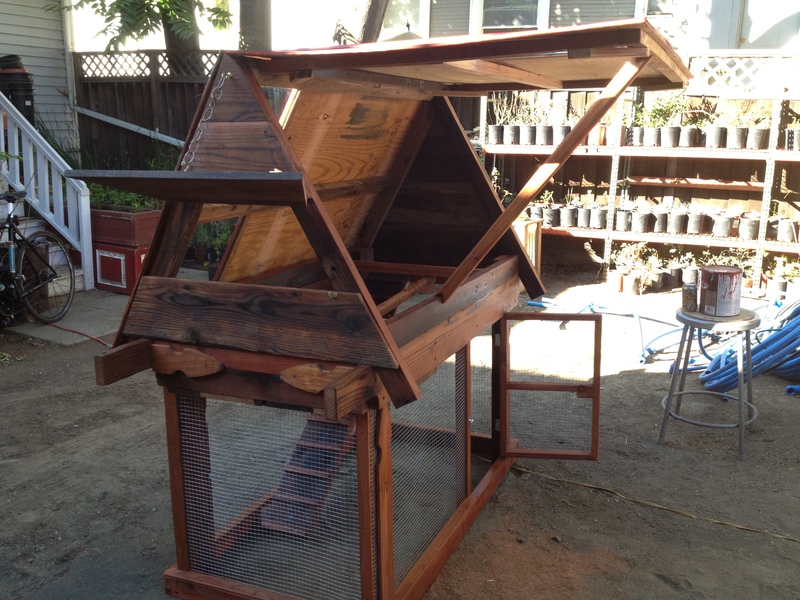 Our coop was built from 95% salvaged material. The framing of the coop is from old fence boards and decking material. The roof is from an old garage door that we painted red. We positioned the windows on the garage door to allow for viewing into the nesting box. Even the latches, chains and hinges were slavaged from vaiours sources.